And still locally, The Telegraph and Argus tells the story of a Haworth 'female plumber' who's been discriminated against in her trade. 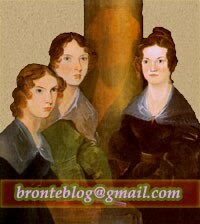 Folio Weekly does a quick roundup of the Brontës and movies. The movies fell in love with Jane Eyre from the start, pumping out eight versions in the Silent Era, followed by at least 15 film and small-screen adaptations. Wuthering Heights, because of its more complicated plot, generated only one silent film; later came the many varied adaptations—including a Bollywood musical! Though the Brontës have been the subject of much biographical speculation ever since their deaths, filmdom has, for the most part, avoided this. There have been only three major film biopics—the first was the 1946 Hollywood production Devotion with Charlotte (Olivia de Havilland) and Emily (Ida Lupino) sparring over Rev. Arthur Nicholls (Paul Henreid). The cast, including Sidney Greenstreet as William Makepeace Thackeray and Arthur Kennedy as Branwell Brontë (the alcoholic brother), is supported by Erich Wolfgang Korngold’s impressive score. But the movie is derailed by a script so stupid and silly, it plays like an episode of Keeping Up with the Kardashians. The trailer for Fifty Shades Freed has just been released and we are rendered speechless by Nerdable's deep understanding of Victorian literature. Quartzy discusses 'the French woman myth'. The problem with that is that those words are used to describe Ginevra Fanshawe, an English - not French - girl. And of course, it's not a French school either.